First we need to understand the naming conventions and the differences between Salesforce and Elements because the username structures are slightly different. We wanted to make it easier to manage multiple Spaces and Orgs - from a single user login - so we didn't copy the Salesforce approach. Note: Sandbox email addressesWhen a Sandbox is created all of the users' email addresses, except for the user who created the sandbox are modified. Historically, the domain example.com was added to the users email address, with the original '@' being changed to an '='. In the recent release Salesforce have changed this to add '.invalid' to the users' email address. Do not use the QuickStart process described below if your email address in the sandbox is not your valid email address. it will create an account in Elements with this email and you will not be able to use the account correctly. 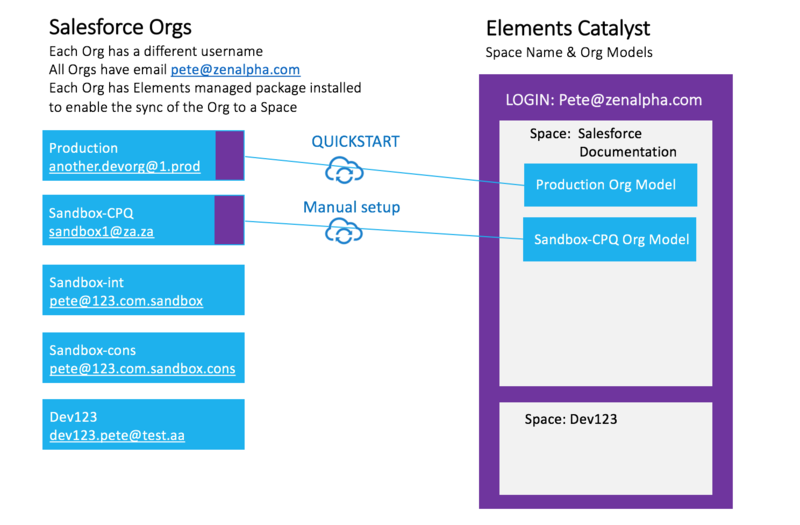 If you are existing Catalyst user and have an existing Team Space you want to sync with a Salesforce Implementation, you must use Manual setup. Do not use the Quickstart. If you are a new user - or do not want to use an existing Team Space, the first install can be using our QuickStart setup. That is because Quick Start creates a new Elements Space called Salesforce Documentation and sets up the connections. QuickStart can be used to connect a Dev, Production or Sandbox. You can change the Space name. Important: When you log into Salesforce Org to use QuickStart you MUST use a username that is associated with the email that is the same as the Elements login. In the example below the email is pete@zenalpha.com If you don't then Quick Start will create a new Elements username which is the email address associated with the Salesforce username. To connect a second and further Orgs to the same Space, you must use Manual Setup. This is because you want to connect to the same Space and if you use Quick Start it will create another new Space. You will need to use Manual setup, but it is only slightly longer than using QuickStart. Select the Elements Settings tab. The Welcome to Elements Documentation Hub for Salesforce page will be displayed. Click on the Manual Setup button. The Elements account tab will be shown. 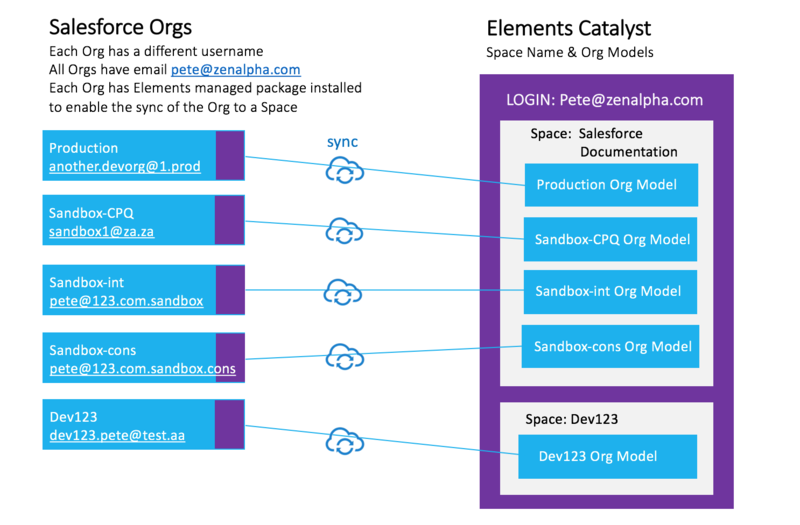 The Elements Accounts tab is used to connect a Salesforce Org to an Elements Space. An Org can only be connected to one Space. This Space should exist already in Elements (but cannot be a Personal Space) and the user must be an Admin for the Space. This can be a different user and account than the user who is logged into Salesforce. Note: when connected to a Sandbox only the ‘Elements Account’ and ‘Org Model Setup’ tabs will be shown. A list of Spaces for the logged in Admin user is an Admin. Only Spaces which can be connected to will be available to select. If the Org is a Production/Developer Org then for the Space to be available there must be an implementation that does not have a Production Org connected to it. By default one Implementation, called Default exists. To add more than one Production/Developer Org to a Space then has to be on the Enterprise, NOT Pro plan. Select the Space and then select the implementation that you want to connect to. Click the ‘Connect Selected Space’ button. Once the Space has been connected to an Org no other Space can be connected to the Org. You can disconnect the Space from the Org if required. Select the Connections from the left menu and the Salesforce tab at the top. The page will show the ID of the connected Salesforce Org. Enable the Org Model by using the switch. Elements is a Salesforce Connected App and in order for Elements to communicate with Salesforce it has to connect to Salesforce. The account used to connect to Salesforce needs Administrator rights. Click on the “Authenticate” link. This will take you to the Salesforce login screen if you are not already logged into Salesforce. CARE: If you have multiple Salesforce accounts ensure that you select the correct account. If you are using a custom domain, click on the “Use Custom Domain” on bottom of the login panel. It will ask you to allow Elements to have access to the following items within Salesforce. Elements will be configured as a Connected App with the following OAuth scopes. This opens up Salesforce on the New Remote Site Settings page with the required fields completed. Select ‘Save’. Once the connection it is possible to configure that the Salesforce configuration data will be synchronized once a day. To enable this toggle the schedule switch. This will request the time at which the synchronization should start. The time is the local time on the device of the user. Other users will see the time displayed in their local timezone. To add package data see the following section. By default the meta data retrieved includes all the information from any of the installed managed packages. To remove or change the packages you need to select which namespaces to include. Click on the Button ‘Managed Packages’. This load the list of namespaces included in the Org. From this select the namespaces to include.